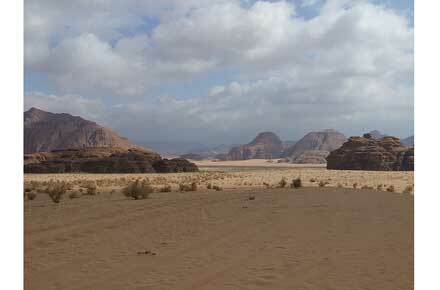 Area romantically (and occasionally imaginatively) made famous by the exploits of TE Lawrence (Lawrence of Arabia). Outstanding desert mountain scenery: justly famous combination of vast multi-coloured towers and cliffs looming over red sandy desert. A protected area with a surprisingly rich array of animal and plant life. 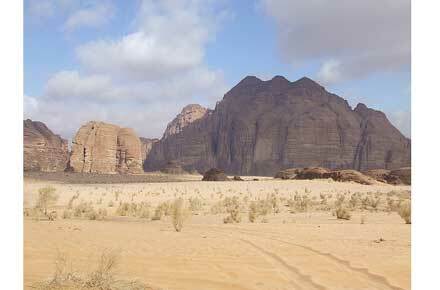 Fascinating Bedouin history and culture. A huge range of long and short walks, and many opportunities for scrambling and climbing. 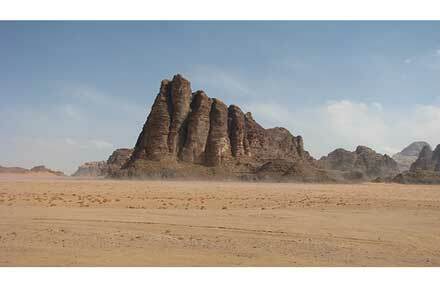 Wadi Rum is famous for its extraordinary scenery and for being a key setting of T.E. 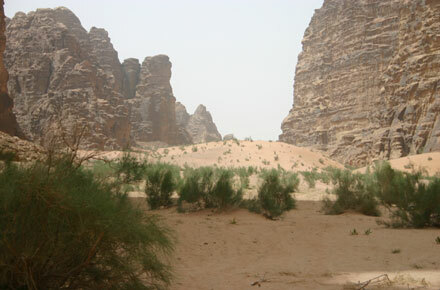 Lawrence's account of his involvement with the Arab Rebellion of 1919, Seven Pillars of Wisdom, which in turn became David Leans classic film Lawrence of Arabia, parts of which were filmed on location here. 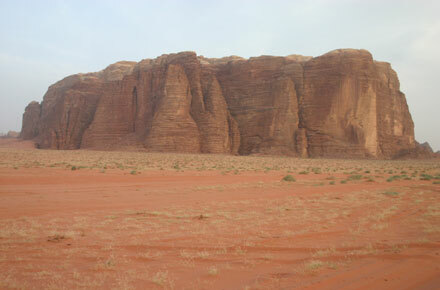 But the real draw of Wadi Rum is its unique landscape of shifting red sand surrounding vast massifs and towers, some of which stand approaching 1,000 metres above the desert floor, all striped with an extraordinary variety of colours, which preside over cliffs, wadis, sand dunes and springs. 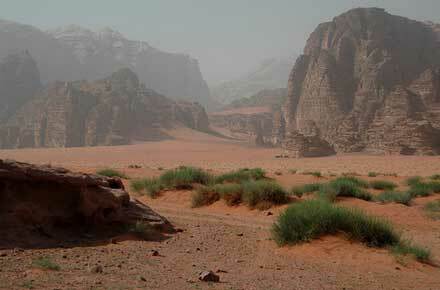 It is so vivid as to seem somehow unreal, as though produced by a set designer just back from a sojourn on Mars. 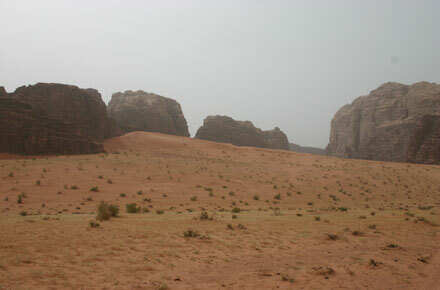 The Wadi Rum Protected Area, a UNESCO protected ecosystem, is a huge stretch of land extending to the Saudi Arabian border. The eponymous valley between its huge cliffs is just one feature of the region, although with justice its most famous one. 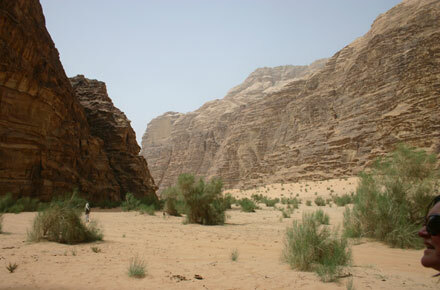 Wadi Rums UNESCO protection extends not only to the general pristine beauty of the area, but to the customs and lifestyles of its Bedouin inhabitants. Because of this, freedom to visit the area on a whim is restricted. But the need to make arrangments ahead, buy permits, and find guides has kept the area well-preserved against the depredations of mass tourism. A large visitors centre has been built at the park entrance, 8km north of Rum village itself, and plans are afoot to expand this for accommodation, food and trade, but otherwise this area is remarkably isolated, pristine and unchanged, with some basic accommodation at Rum village and occasional campsites nestling at the foot of cliffs. Despite its forbidding landscape, the area has been inhabited and grazed since prehistoric times, and is scattered with the remains of both nomadic-pastoral civilisation and, around the springs, of more settled communities. The ruins of a Nabataean temple at the foot of Jebel Rum and a smattering of horned altars show that it was clearly an important site for the builders of Petra, and it was a stop on the Yemeni Frankincense Route. 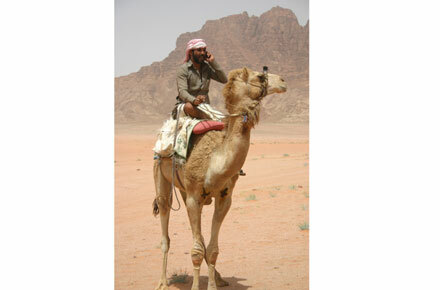 Although many are now settling in the local villages, the Bedouin culture remains strong, and learning about their ways is one of the fascinations of the area. 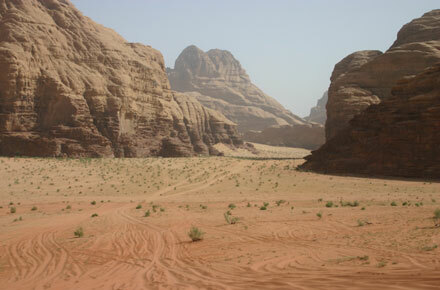 Wadi Rum is home to a number of species including striped hyena, rock hyrax, the recently reintroduced oryx and, of course, both snakes (the deadly horned viper) and scorpions. 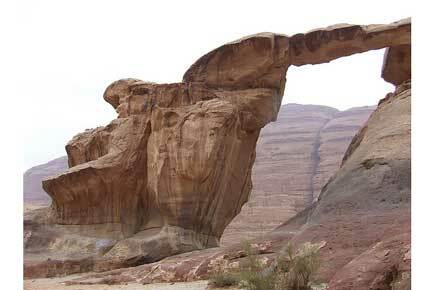 The area is composed of gently sloping layers of sandstone on a base of ancient igneous rock, with a harder upper layer slowing the erosion of the great towers.Inside the Protected Area, you can only camp. While the camps are not luxurious, at least one night in the desert is a must and it is generally done with charm and great atmosphere. Tourism does undoubtedly have some negative impact: 4WDs trundle around the better known sites, their tracks everywhere, and (admittedly discreet) camps huddle in sheltered or scenic corners. Although wild, it is not wilderness. There is an endless variety of walks, to suit all tastes and fitness levels. The following walks, and many more, are described in the Cicerone book. At the easiest end is the short walk up to Lawrence's Spring, mentioned, twice, lyrically in the Seven Pillars. 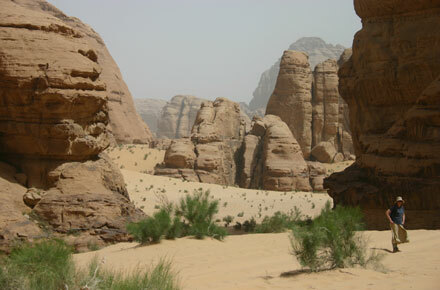 Circling Jebel Makhras (see Wadi Siq Makhras page), home to the Seven Pillars of Wisdom formation. Winding up the spectacular Wadi Siq Makhras, then crossing fine desert to the outstanding Siq Um Ishrin. 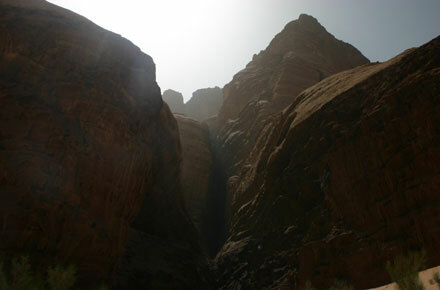 Traversing stunning Rakabat Canyon in the Jebel um Ishrin massif which forms the eastern wall of Wadi Rum. (This can be added to the previous walk to make a long but amazing day). 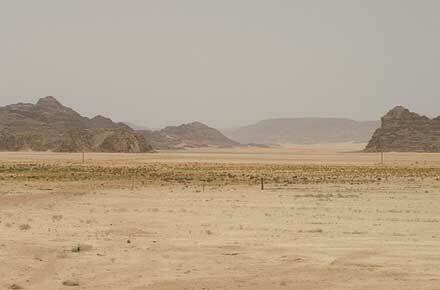 Circling the huge Jebel Rum massif, which is Wadi Rums western wall. A 7 hour circuit, although there are ways of reducing this. See the Cicerone guide and Routes below for more information on this walk. Climbing Jebel um Adaami, Jordons highest mountain, on the Saudi Arabian border. 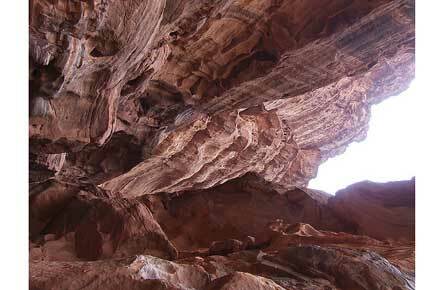 The Jebel abu Khashaba canyon. If you can, you should get up high to enjoy the outstanding views. 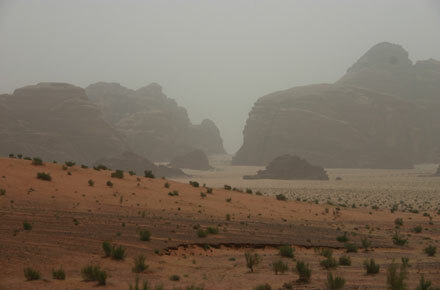 There are some reasonably easy clambers, such as the Jebel Ahmaral Shelaali ridge near Lawrences spring and the more distant Jebel um Adaami. The demanding scramble above Khazali Canyon. Various routes onto Jebel Rum (see Cicerone guidebook). 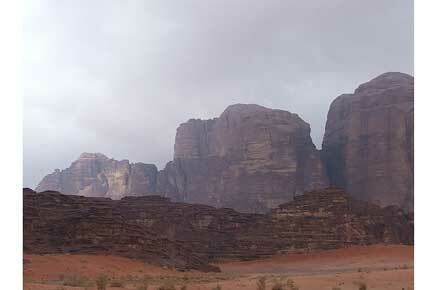 Wadi Rum is also one of the Worlds finest rock climbing centres. 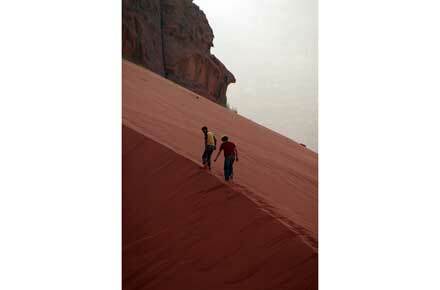 Multi-day walks can be created, wonderful combinations of dramatic hiking and desert camping. Highly recommended. 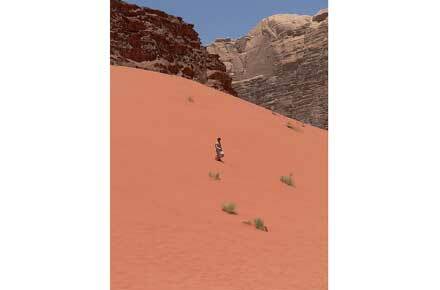 We were in Wadi Rum too late in the year - mid May - for the best walking conditions. Both days we were there got to around 40˚C: unseasonably hot, apparently, but even if the temperature had been a bit less, more than a few hours walking in the morning and late afternoon would have been unthinkable. So, plans had to be modified: a 7 hour walk round Jebel Rum, the biggest massif, was jettisoned, as was a scramble up a ridge to get a big view. Be prepared to be flexible. 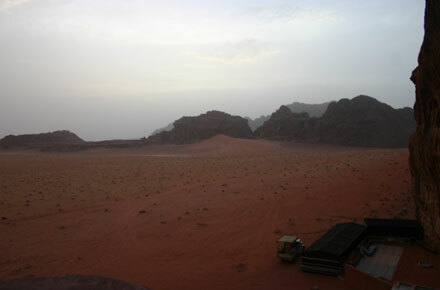 In Wadi Rum a great camp to base yourself from is the Bedouin Expedition Camp http://www.bedouinexpedition.com Once there you can simply choose what sandstone hill/small mountain you want to climb each day. 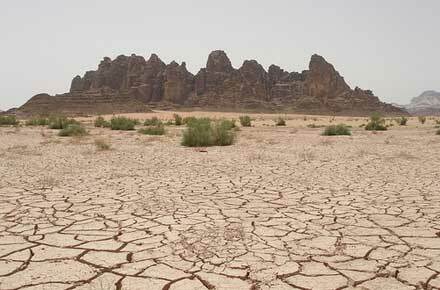 Once you get to the visitor centre at the entrance of Wadi Rum Protected Area just simply ring 0779312344 from inside Jordan or if you want to plan beforehand +9620779312344 from outside Jordan. 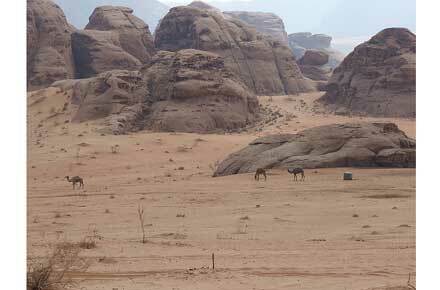 The camp also has Jeep, Camel, Climbing and Hot Air Balloon Tours. 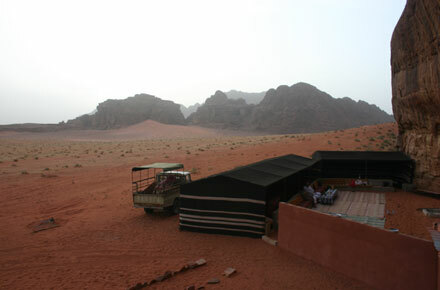 You can sleep in Bedouin Tents, under the stars or in a cave!!! 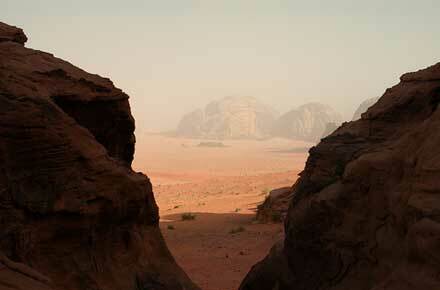 When you want to leave Wadi Rum they can organise a bus to Petra or taxi to Aqaba. 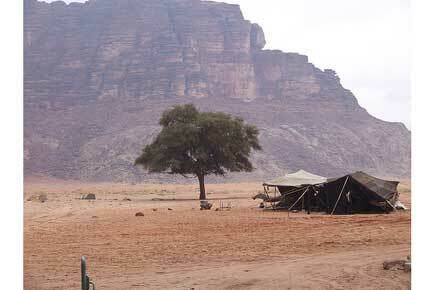 The camp is in the World Heritage Protected Area and is very stunning. Their office is in the small town where you can buy water and food. There is free wifi in their office which you can use if you need to. All tours will start from the office so you have time to get yourself organised. 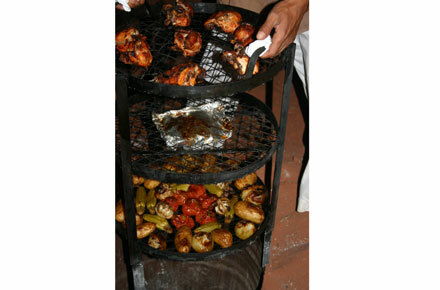 Using this company will ensure you have a peaceful, safe and hassle free time in Wadi Rum.